We had the joy of welcoming our new General Councillor Sister Shirley Ann Stevens to our Province. She began her visitation in the Philippines from 3 - 10 October than continued on to Suva, Fiji Islands 11 - 18 October, Rarotonga, Cook Islands 19 -26 October and finally to New Zealand 27 October - 10 November. We are very grateful to our Mother General Sister Clare Stanley and her Council for allowing this to take place. We hope Sister Shirley Anne enjoyed visiting us and takes with her a good understanding of how our Mother Foundress Blessed Anne Marie Javouhey lives on in the Asian - Pacific Rim in our world. Thank you Sister Shirley Ann Stevens for your visit and your encouragement and wisdom shared with us. God bless you in your service to us and the Congregation of the Sisters of St Joseph of Cluny. 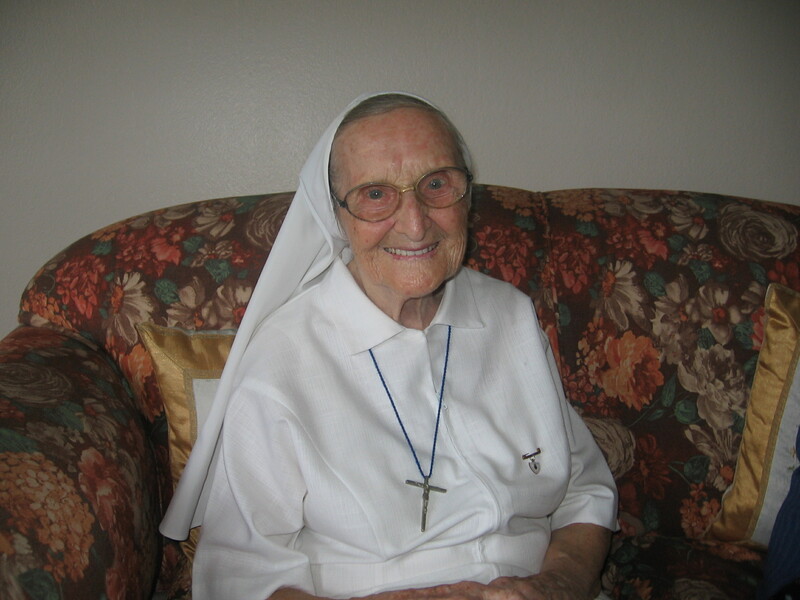 Sr Angela Cavey was born in Dublin, Ireland on 25th January 1914. She was affectionately known as Peggy having been christened Margaret. She was the youngest of two children both girls. They remained very close to each other over the years. Her Sister married and had two children still living in Ireland today. A nephew, Gerard Potter and a niece Susanne O’Rourke. Angela had her primary education in Dublin at the National School run by the Sisters of Mercy. Her Secondary education was with the Sisters of St Joseph of Cluny in Mount Sackville, Dublin. It was here that she felt the call to give her life to God. In 1936, she entered the Novitiate and began her postulancy with 10 companions. They were received as Novices on 11th March 1937 and in April of the following year, 1938, sixteen Irish Novices of whom Sr Angela was one, left for Paris which in those days was a very long trip by boat and train. They were headed for the Central Novitiate in the General House in Paris. They joined other novices from all over the world, 100 in all. On 20th March 1939, Sr Angela made her first profession and was missioned to West Africa. In preparation for this she was sent to England to do a Teacher Training course. However, World War 2 broke out in September 1939 and there was no hope of travelling so it was not until early 1942 that Sr Angela and 2 other young Cluny Sisters set sail from Liverpool for West Africa. They joined a convoy of 45 ships, carrying troops and civilians. The sisters were on the commodore’s ship, in the centre of the convoy, sailing across the Atlantic Ocean in formation until they reached North Africa. Here they split up and the sisters continued on. It was a journey of three weeks and they arrived safely in Freetown on 1st April 1942. Sr Angela spent 8 happy years teaching in the Secondary school. In 1950, she set sail for a well-deserved break in Ireland and it was there that she received a new obedience, this time for Australia. 12 Sisters set sail from the Tilbury Docks in London on 12th April 1950 bound for Melbourne. This was a new mission and Sr Angela was amongst the pioneer group that were to work as Domestic Staff for the Seminary and open up an aged care facility for the elderly. Sr Angela spent two years helping in the care for the elderly and a further 8 years as Novice Directress for the young Australian Candidates joining the Congregation. In February 1960 she was transferred to New Zealand where she spent a short time teaching in Tauranga before taking on the responsibility of training the Novices in the New Zealand Province. She held this responsibility for 6 years after which she was transferred to the Mission in Fiji in 1967 as a teacher in St Joseph’s Secondary School. After six years she was given a break to visit her family in Ireland and was then missioned to Rarotonga in 1974 as a teacher in the Primary School. 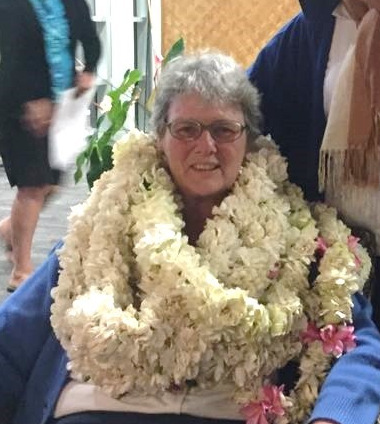 She remained in this mission until 1980 and spent the rest of her life in Fiji teaching at St Joseph’s Secondary School and holding the position of Community Leader until 1988 when she was asked to join the Novitiate team which was now based in Toganivalu Road, Suva, Fiji. In 1988 she joined the Community at St Anne’s Hercules Street and was very active taking some small groups for class and generally carrying out works of charity for which she was exemplary. 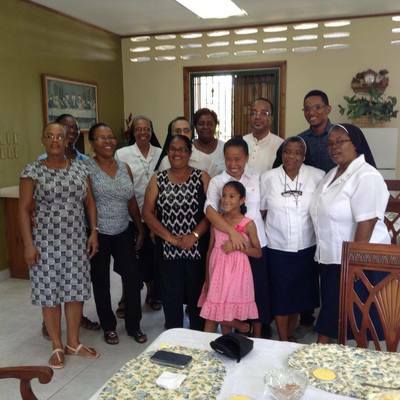 She remained in this community until the Congregation withdrew from this apostolate and retired to the Novitiate Building in Toganivalu Road in 2012. As the Province is in a period of discernment regarding various works, Sr Angela and her companions recently moved to the Convent in Waimanu Road and it was here that she suddenly fell ill having reached her 101st birthday a few months earlier. God gently called her home 1st March after a short illness. She gave her life back to God as she had lived it, gently, graciously and lovingly. The sister with her was touched by the humble way she asked for the sacrament of Confession despite her suffering. Perhaps she knew more than anyone, that her time to be called home was near. Sr Angela was an outstanding missionary. Most of the younger members of the Province remember her as the one who helped them greatly in what it meant to be a Cluny Sister. She lived our Charism to the full….a true missionary whose heart reached out to those who needed most in whatever way. She lived as a truly humble and gracious sister who was always ready to serve in whatever way she was asked. Her witness to so many shone out and won hearts for God. We will greatly miss her calm, gentle, honest, humble and faithful witness. The Province is richer for having been privileged to have as a member, such a wonderfully dedicated missionary for 58 years. Thank you, dear Sr Angela. Now receive in full your eternal reward. On Friday 19th February 2016 most of the Sisters of the New Zealand communities gathered in Tauranga to mark the 75th Anniversary of Cluny Sisters presence in New Zealand. We also have the privilege of all council members of the province present for the 1st provincial council meeting. The celebration was held on Saturday 20th February. It began with a thanksgiving liturgy in the chapel followed by a PowerPoint presentation. This enabled the sisters to share memories of their experiences over the years. After afternoon tea we all gathered at the Catholic Cemetery in 18th Avenue to remember and pray for our deceased Sisters who are buried there. Nineteen sisters rest in peace in this place. We thank God for their lives and for their service to the Province and the mission. Hooray!!! At long last we have managed to establish a wonderful group of vibrant women to join us as Cluny Associates. We have had three successful gatherings to initiate them to be part of our mission. The first gathering saw us with 11 interested ladies. Today the number has increased to 15 ladies. They are from the Parish of St Thomas Aquinas. Four of the members are from the St Mary’s School staff. They all have a great love for the Sisters and the work of the Province. They are of different ages and cultural backgrounds. We are very blessed to have them wishing to commit themselves to our Cluny way of life and mission. We celebrated together the feast of St Joseph which they organised themselves. It was significant for them and they thoroughly enjoyed it. They are still sharing their experience of being part of the Cluny charism. Our hope as community is to involve the expertise of these women in ways to help us with the running of our Retreat Centre. The ladies are also very keen to support us in any of our mission works. We feel very blest to have such a wonderful group of women willing to walk with us. Early in January we had the pleasure of a visit from Sister Allison Macalister (Provincial Leader) on the occasion of the ceremony of Final Profession of Sisters Senoveva Soqe and Teresia Vasenai in the Cathedral. His Grace the Archbishop Peter Loy Chong was main celebrant. It was a beautiful ceremony. 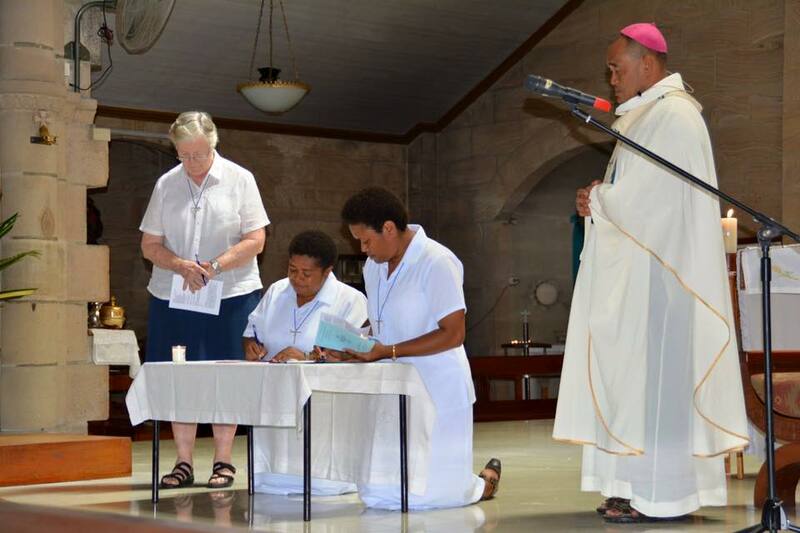 Sisters Senoveva Soqe and Teresia Vasenai made their Final Profession on 16th January 2016 in the Cathedral of the Sacred Heart, Suva Fiji. We are moving towards establishing Cluny Associate Leaders, whereby the members themselves will organise their own meetings, set dates for meetings and organise other reach out activities they might wish to engage in. The Sisters will always be around to help and to provide support in any way needed as well as provide the venue for meetings. About 25 young people, youth leaders and adults from the diocese of Rarotonga are registered to attend the World Youth Day in Poland at the end of July, 2016. Preparations include fundraising, monthly Youth Mass and inter parish sports competition. On Easter Monday, March 28th, the youths organised a Volleyball competition, held at Nukutere College school grounds, with various prizes donated by Fr Damian. An Ambrose bowling competition was held soon after on Friday the 1st April and it was equally successful with good support from so many. April 23rd we had the joy of receiving the first vows of Sister Rina Caranay to the Congregation. The ceremony took place in her Parish Church of St Isdore in Labrador. Her mother and family were present as well as the Sisters, friends and parishioners. Sister Rina’s vows were received by Sister Natividad the superior of the communities in the Philippines. It was a very joyous occasion. We celebrate Sister Rina and welcome her to our congregation. We wish her the graces and blessings as she continues her journey as a Sister of St Joseph of Cluny. "The venue is quiet, functional, comfortable. An outstanding spiritual atmosphere that allowed us to achieve all our goals for the weekend." "We really enjoyed being here and appreciated everything you have done for us." "We have no complaints and plan to come back"